To give a round figure, let’s say that important Jerid palm groves are around one thousand hectares, and that the average surface of a garden is less than half a hectare. 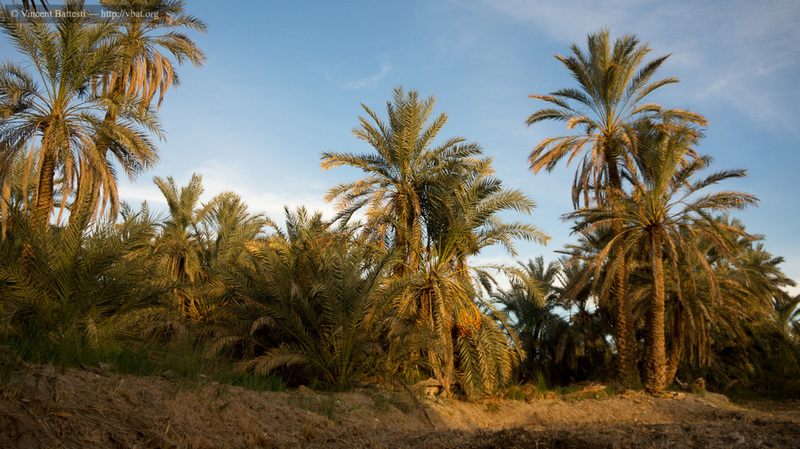 The different oases of the Jerid region host the ideal-type of the oasian palm grove, a puzzle of thousands of overlaid gardens, structured vertically. In most of the cases, a three-level structure is adopted in the garden: fruit trees, which grow under the shadow of the palm trees, cover vegetable or cereal cultivation. This structure creates its own microclimate, and along with the major components of the oases (irrigation system, etc. ), they are answers to the pedoclimatic conditions. These answers were selected and implemented by generations of gardeners. The result of centuries of daily practices can be seen and analyzed today as an oasian landscape. Oases of the Egyptian south, Dakhla and Kharga.